Who realised that non-financial performance could excite such passion? But this article posted in May, drew the biggest response to anything I have written online. And largely about one topic; monetisation of the non-financial. It is the idea that converting non-financial factors and inputting to financial analysis is either feasible or even desirable that had pulses racing. To reiterate what I have said and written countless times in the intervening months; until we can put hard financial values on at least some of the fundamental non-financial drivers of organisational performance, there can be no real progress from where we are now incorporating in business case analysis, investment modelling or genuinely integrated reporting. Anything that settles for running non-financial indicators in parallel with robust financial analysis serves merely to perpetuate the sort of organisational schizophrenia best exemplified in company use of balanced scorecards as the preferred tool for strategic implementation while basing all significant investment decisions on NPV calculation where the non-financial is, at best, a footnote. It is not pursuit of the holy grail but the logical next step in evolution of a better valuation convention. I am not going to convince those of a different theological perspective who view any attempt to put a £ or $ sign on every environment or society influence as a new capitalist chimaera. But then I am not seeking to internalise externalities or include social impacts in valuation processes that are not directly, statutorily or reputationally relevant to the equation. I suppose that’s where my take on valuing non-financial performance departs from higher-purpose corporate responsibility or sustainability. I suggested it was a new valuation paradigm but that is probably hyperbole. It can, perhaps, be said to more accurately reflect a required change in current management, investment and accounting conventions. It is a shift from the metaphorical to the metaphysical where an acceptably imprecise but no less reasoned computation of critical factors of production, transformative management systems and processes, and outcome components are factored into conventional valuation approaches. So how imprecise is acceptable? Well, it’s probably no less precise than valuing companies by extrapolating current earnings performance into the future on the basis of some notional annual growth trajectory discounted by a cost of capital, weight averaged or otherwise, which no-one – and certainly not the ratings agencies – is ultimately able to calculate with any great certainty. Little wonder, therefore, that discounted cashflow forecasts tend to be calibrated by reference to comparable sector or industry price:earnings ratios. Convention suggests such projections need to fall within the bounds of what is deemed reasonable and any outliers generally tolerated only if they undershoot the consensus. So, can non-financial performance be appropriately factored into an already imprecise science without distorting results beyond the acceptable? KPMG certainly thinks so; it is the core of their New Vision of Value published in 2014 with fictional case studies but now garnering a growing body of client supporting evidence. In no way would I claim any credit for this work but I did share a platform with the report’s authors – at a KPMG client conference in Helsinki in 2012 – the precursor to several subsequent conceptual discussions. The KPMG methodology is based on simulating scenarios – effectively a cost:benefit comparison – accounting for key externalities; stakeholder action, regulations and standards, and market dynamics. It derives an NPV calculation where these externalities’ impacts – positive and negative – are played out on revenues, costs and risk. But, it seems to me, the assumption of returns being generated from responses to externalities and drivers of their internalisation – the so-called ‘megatrends’– give the approach a long-term value horizon (or reliance on social and environmental returns as balancing items) that is simply beyond practical application in most companies. NPV analysis over anything more than a 3-5 year period is rare given that, on typical cost of capital assumptions, the present value of returns in year 5 is around 50%. Of course, we have to think long term. But we also have to accommodate shorter term imperatives. The valuation of non-financial performance must be aligned with the prevailing orthodoxies to make sense of a market that values companies, today, on discounted earnings over the next 10, 15 or 20 years. The bulk of those discounted earnings are generated in years 1 to 5 and largely from current ‘steady state’ earnings, not anticipated future value creation from new products, markets and business models. The famous Ocean Tomo chart showing the flip in excess company market value over intrinsic book value in the past 40 years or so – from 20:80 to 80:20 – masks the continuing tension between long-term valuation horizons and serial short-term earnings cycles. That tension is laid bare in Blackrock CEO Larry Fink’s challenge to companies to set out their long-term strategy and performance targets. Can they reconcile long-term aspiration and cumulative short-term performance? The change Ocean Tomo illustrate is not created by some sort of metamorphosis in the nature of balance sheet assets – either intellectual or any other form of intangible capital – but a much greater market emphasis on future earnings allied to long-run changes in the pricing of cash and hence risk. Companies now not only need to project future earnings growth but how they will retain and grow the capability to deliver it. Those that do will outperform; those that do not will come under market pressure to raise their game or hand over to those who can. From experience, working with many companies across different sectors, I believe the solutions are already apparent. Much of the required data already exists within companies and it is a question of joining the dots. Some companies have a strong sense of what makes them work and, occasionally, articulate it in private. But few, if any, will attempt to demonstrate this in public, especially where statutorily required to justify or validate such assertions. That’s why many critical non-financial performance metrics – employee engagement and net promoter score, for example – are widely used but, judging from the evidence of leading data providers, much less frequently reported. And where they are reported, no attempt is made to valorise or even connect to key financial drivers. Yet it is this type of ‘supermetric’ – one of five or six that could credibly be called such – that is the potential Rosetta stone to translating the non-financial into financial. They are not just indicators or heuristics. Years of employee engagement analysis and comparability data exists in the handful of consultancies – Towers Watson, Aon Hewitt and Gallup to name three – that support employee engagement measurement in leading companies. They are able to identify performance norms and sectoral outperformance across markets. They connect to it to financial performance. Despite that, companies are slow to use this data – their own data – to compute internal investment and business cases. They probably accept the global ‘macro’ proposition that employee engagement drives sales and inspires more effective production but are reticent to extend the analysis to specific ‘micro’ processes and programmes. 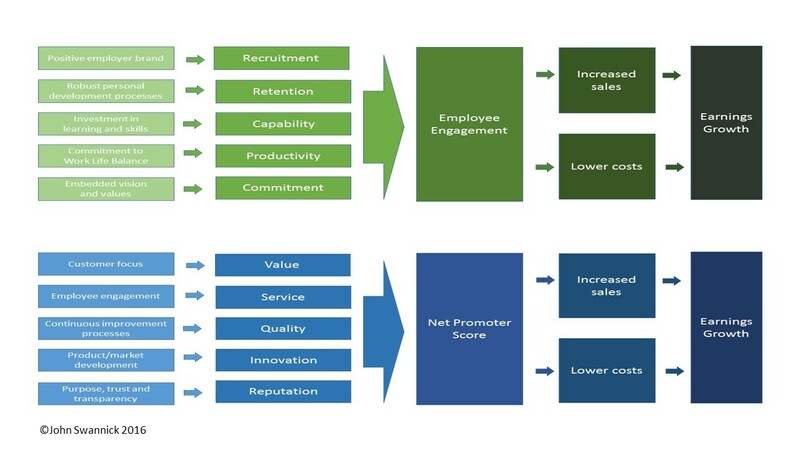 We know the drivers of employee engagement and of the customer or brand perception reflected in Net Promoter Score. There are at least 140 identified factors of employee engagement and I only show five here. And each factor has multiple influences that are company, or even functionally, specific. But it is possible to go beyond the anecdotal or narrative and isolate the most important influences and, by extension, their value in sales and cost reduction. At one level this ability should transform the effectiveness of NPV analysis in internal business cases. The cadre of change and project managers who now deliver the bulk of these business cases in many big companies are probably well placed to develop the thinking. It might need a paradigm shift from those who govern the change/project ‘industry’ conventions like ADKAR and PRINCE2 but, from what I have seen, they may be willing to accept the challenge. At another level, if the individual project or programme is significant enough – that is material to future earnings projections – the NPV case could be exciting for investment analysts in its own right. But it is a logical next step to bundle multiple business cases into a compelling big picture that not only supports a revision of analysts’ earnings forecasts and target stock price but enhances the narrative around the company and its capacity for further strategic innovation. These are the sort of conversations between companies and analysts – in the four or five direct contacts that a typical company analyst will have with the CEO or CFO each year – that could move the ratchet in understanding of non-financial performance and its contribution to financial performance. After all, we are talking about a very small target audience – I believe Unilever is the most ‘followed’ company by 20-25 company analysts – and conversations where some of the statutory constraints of public reporting do not apply. Posted in employee engagement, investor relations, management, reporting, strategy, value.